This page is a continuation of the page study of the science of sound. An important measurement of sound is the frequency. This is how fast the sound wave is oscillating. This is different than how fast the wave travels through the medium. Frequency is measured in hertz. The faster the sound wave oscillates the higher pitch it will have. For example, on a guitar a big heavy string will vibrate slowly and create a low sound or pitch. A thinner lighter string will vibrate faster and create a high sound or pitch. See musical notes for more on what makes up a musical note. Not only is hearing sound important, but we also create sound to communicate. The process of making precise sounds for speech is very complex and involves many parts of the body working together. Sounds are made by our vocal cords vibrating in our throat. 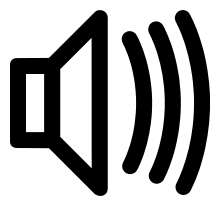 This way we can adjust our volume and our pitch. We also use our lungs to force air past our vocal cords and start them vibrating. We use our mouth and tongue as well to help form specific sounds. It's truly amazing we can make a sound let alone the complex system of sounds humans can create to communicate with speech. Acoustics is the study of how sound travels. It's important in controlling how sound behaves and is used in designing buildings like auditoriums, theaters, and libraries. In some cases acoustics is used to help sound travel. For example, in a large concert hall, acoustics helps so that everyone in the building, even the back seat, can hear the music. In a library, acoustic design would help to keep sound from traveling to help the library stay quiet. Reverberation - reverberation is how sounds bounce off things. Typically a "loud" room would be one where the sound is reverberating off the walls and floors. Some materials echo sounds better than others. For example, a tile floor will reverberate a sound better than a carpeted floor (which would absorb the sound). Absorption - The opposite of reverberation, items that absorb sound don't reflect the vibrations. Soft items such as carpet and curtains will help to absorb sound and make a room quieter. If you are standing still and a car drives past you, the frequency of the sound will change as the car passes you. This is called the Doppler Effect. The sound pitch will be higher as the car is coming towards you and then lower as the car moves away. The sound the car is producing is not changing. Its frequency is the same. However, as the car is traveling towards you the speed of the car is causing the sound waves to hit your ear faster or at a higher frequency than the car is making them. Once the car passes you, the sound waves are actually reaching your ear at a lower frequency. The Doppler Effect is named for scientist Christian Doppler who discovered it in 1842.